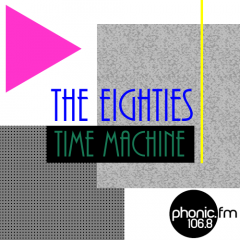 Eighties Time Machine is a Radio Show on Exeter’s Phonic FM. With a keen respect for producers such as Arthur Baker, Arif Mardin and Alan Tarney we like to go waaaay beyond the remit of national and commercial radio and explore the decade in much more detail than is quite normal. In addition to classic singles when you listen to us you will hear 12″ extended remixes, b-sides album tracks, stuff which missed the charts or perhaps was not even released in the UK. We will scour the charity shops’ vinyl bins for you. We’re not precious about genres either. Sure we have our favourites such as Italo Disco and Sophisti-pop, but we also love to hear things we may never have heard before from Indie labels like Rough Trade and Cherry Red. Not forgetting of course the burgeoning house era as people like Frankie Knuckles appeared on the scene, and we like remixes, lots of remixes, you will hear those from Shep Pettibone and Ben Liebrand amongst others. We’ll even play rock if you ask nicely. All forms of entertainment should come with a strict code of rules and regulations, obviously, and our rules are that we only play tracks we haven’t played before and that were recorded or remixed in The Eighties. If you want to know if your choice has been played already, you can check out our searchable playlist here. Listen to us live on Phonic FM or, if you live in the Exeter area, you can go really old school and tune us in on 106.8FM. For smartphone or smart speaker, you can also find us on the Radioplayer or TuneIn apps by searching or asking for Phonic FM. Really, the only way we could make it easier for you is to come round to your house with a Ghetto Blaster and a Mixtape!